Did you know that rainy days affects animals? You and I do different things when it rains. We may stay inside and read a book instead of playing baseball. White-lined Bats change their habits on a rainy day too! Nice days send the bats to the tops of mango trees where as many as ten White-lined Bats can be found roosting together. On a rainy day, these same bats will roost only halfway up the tree. A mother bat and her young will roost about three to five meters from the ground. Rain or shine bats need their sleep to be ready to swoop through the nights skies. 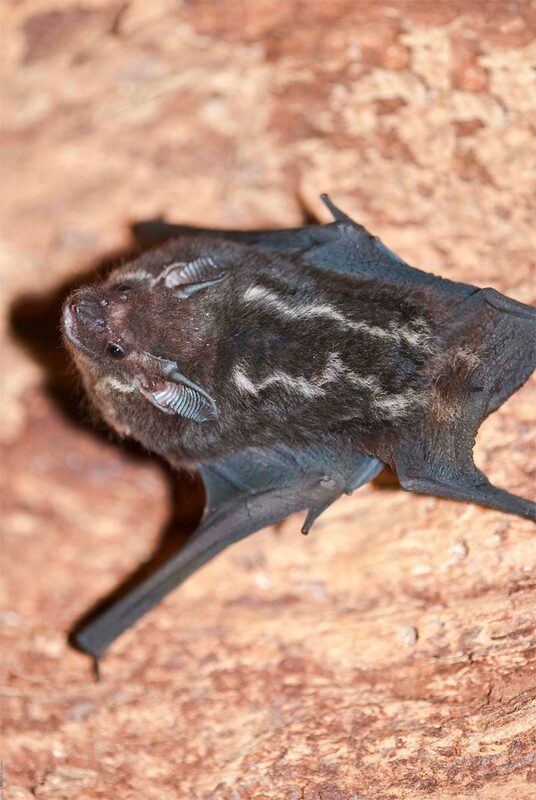 The total length of the head and body of the White-lined Bat is 48- 99 mm. These dark brown or black flying creatures have a pale face and light dorsal stripes. This stripe runs from its ears to the tail membrane – it has no visible tail. Small white stripes also show on the face. The White-lined Bat’s diet mainly consists of fruit with a few helpings of insects. Flower nectar may add a little variety on occasion. Male bats fail to combine themselves to one female. Their harem may consist of as many as twenty females. They breed all year long, except in parts of Brazil where pregnancies occur only from the early dry season to the end of the rainy season. The female bat may become pregnant while she is still lactating or nursing babies. E-mail info@brazilianfauna.com to add your White Lined Bat related website.